Proverbs 16:1-9 – We can gather our thoughts, but the Lord gives the right answer. People may be pure in their own eyes, but the Lord examines their motives. Commit your work to the Lord, and then your plans will succeed. The Lord has made everything for his own purposes, even the wicked for punishment. The Lord despises pride; be assured that the proud will be punished. Unfailing love and faithfulness cover sin; evil is avoided by fear of the Lord. When the ways of people please the Lord, he makes even their enemies live at peace with them. It is better to be poor and godly than rich and dishonest. We can make our plans, but the Lord determines our steps. “The summer after my junior year in high school I went to a church camp as I had done every summer. I was feeling overwhelmed because I needed to figure out where I would go to college and what major I wanted to pursue. I had ideas about what I wanted to do with my life, but I wanted assurance that God had the same plans for me. I had been praying for weeks, but I still didn’t have any answers. I was afraid I might mess up God’s plan for my entire life. “. . . I walked into the worship service ready to hear voices from heaven, sure that God wasn’t going to remain silent. My high hopes were crushed when I walked out of the chapel that night. God hadn’t told me anything. 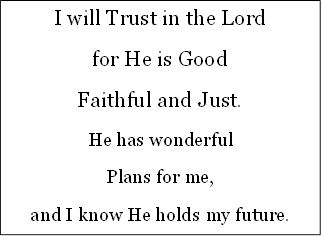 THOUGHT FOR THE DAY – Even when I don’t recognize it, God is faithful. Prayer: Dear Lord, help us to come to you during times of struggle. Give us patience to wait for your guidance. Amen. This entry was posted in Comfort, Encouragement, Guidance, Hope, Inspiration, Love, Peace and tagged Accept, Acceptance, Actions, Advice, Age, Application, Apply, Assumptions, Attitude, Beauty, Believers, Bible, Blessings, Carelessness, Challenge, Change, Character, Children, Choices, Christianity, Circumstances, Comfort, Commitment, Compare, Confession, Consequences, Courage, Covenant, Death, Death of a child, Decisions, Desires, Destruction, Dreams, Encouragement, Endurance, Example, Excuses, Expectations, Fairness, Faith, Family, Foolishness, Forget, Forgetting, Forsake, Fullness, Future, Gifts, Giving, Goals, God's will, Goodness, Grace, Greed, Guidance, Hardened Heart, Hatred, Heart, Hiding, Holy Spirit, Hospitality, Humility, Hypocrisy, Impossibilities, Intentions, Jobs, Justice, Knowledge, Lazy, Life, Life's Guidance, Lifestyle, Light, Loneliness, Lying, Marriage, Miracles, Mistakes, Money, Morals, Motives, Needs, Negative, New, Obedience, Opinion, Opportunities, Oppressed, Parents, Past, Patience, Persistence, Perspective, Plan, Plans, Possessions, Power, Prayer, Preparing, Pride, Problems, Promises, Provide, Reason, Relationships, Renewal, Requests, Resources, Respond, Responsibility, Restoration, Results, Right, Scripture, Security, Seek, Seeking, Self, Self-Centered, Soul, Spiritual gifts, Spiritual Growth, Spiritual Rebirth, Success, Suffering, Support, Surprises, Thoughts, Time, Timing, Troubles, Trust, Unity, Usefulness, Values, Vision, Waiting, Wealth, Willingness, Wisdom, Words, Work, Wrongdoing. Bookmark the permalink.